Horse racing is among the oldest games and gambling pastimes in human history, and the thrill of the sport has consistently kept it among the most attended as well. Once the gate goes up and the starting bell rings, anyone watching would be hard pressed to not hold their breath. Those with bets on a particular horse even get to experience the race as though they were right there in the saddle themselves. It’s no mystery that people from all walks of life flock back to the track year after year to take part in the tradition, excitement, and rewards of the classic competitive partnership of man and beast. 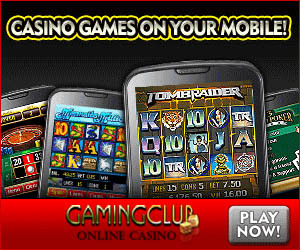 Gaming Club makes it possible for you to take the reins yourself and experience the thrill of this time-honored sport by bringing you Royal Derby mobile virtual horse racing in their online casino. Now you can enjoy the gripping excitement of the track from anywhere you can take your mobile device. If you want to bet on real horse races, place check out the page about mobile betting. Remember, there’s more to winning than simply picking a horse and hoping it wins. There’s skill in picking a winner, and the depth with which it’s undertaken is only limited by the amount of thought a bettor is willing to put in to making a winning pick. A horse that might dominate in one race might have disadvantages in another. Only careful observation and a strong sense of history and statistics can decide if any given competitor is at home and set to win on a particular occasion. Every race is different, and it’s important to make a wise and well-informed choice for your horse to win. Factors like the weather, track condition, track record, and even the time of day can all play in to how a horse will do in that race. All of those things are just as important as the odds placed on the horse itself. Clicking on one of the six available horses to bet on will show you all of those things, as well as the name of the jockey and his performance record. Check all of those factors and you will be on your way to picking a winner like a real high roller. After choosing your horse, it’s time for you to place a bet. You can select any amount that you wish. Then, you’ll need to choose the type of bet that you’d like to place. A “To win” bet will award you the payout odds for your selected horse, but only if that horse comes in first for the race. You can also select an “Each way” betting option, under which you may place two bets; one of your horse finishes in first place, and another for if it finishes second. After you have selected your horse and placed your bet, click on the “Race” button to start the real fun. When the race starts, you’ll see an adrenaline pumping animation of a virtual horse race with all the excitement and suspense of being at the track. When it’s over, you can race again as many times as you like. Every race is different, but all the heart stopping thrills will be exactly the same.